I’m glad I’m not the only person that has happened to! Some years ago, one of my husband’s Aunt’s passed away and we were to attend her Memorial Service at the small, clapboard, country “Family” church. We pulled into the parking lot to greet family members, and one of the Aunt’s daughter’s looks at me and says I’m told you play the organ. I saw spots for a second and said Yes, do you play as well? No, I don’t, but would you play for Mother’s Service? 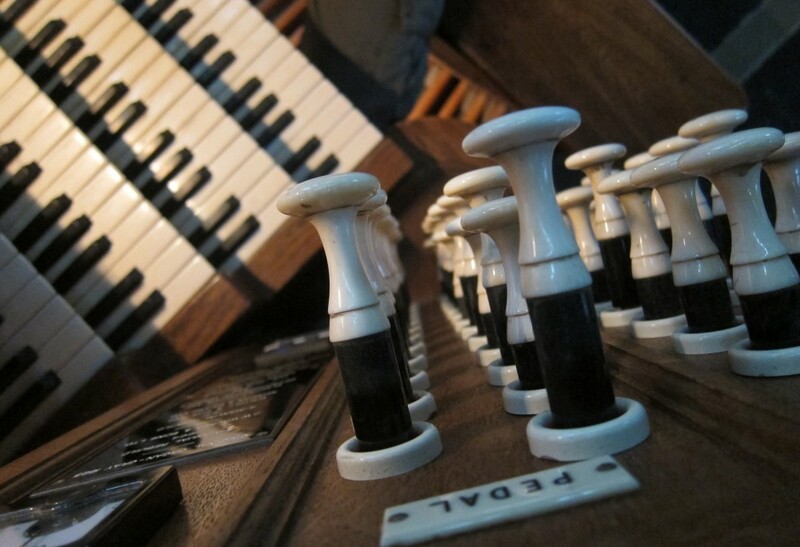 It never occurred to us to have an Organist (you ARE kidding, right?) play ! I shot THE LOOK at my husband when I saw an old Broadman Hymnal coming my way with Cousin JoAnn flipping pages. I was surprised and relieved to find it was not an old pump Reed organ but a small 2 keyboard Thomas home-sized Spinet. I started the first verse of Holy, Holy, Holy. No problems. Went to the lower keyboard for the second verse, and out came Latin Chords, Drum & Rhythm !! I recovered, went back to the Upper and stayed there. I could FEEL my face burning red, and after the service when we went to Cousin Janet’s house to eat, EVERYONE thanked me for playing, never mentioned the mishap, and welcomed me totally into the bosom of the family. Many years ago I developed a policy when asked to play for services at unfamiliar venues of rehearsing a relatively simple version of the requested music assuming limited choice of stops and no registration aids, on the basis that it is easier to embellish on the day than to scale back. Despite that I have still been caught out twice at weddings when, arriving with my organ music, the only available instrument has been a Clavinova. My biggest double-take though was at a family funeral. I knew the church in question had an electronic organ, but it was only when I got to the console that I discovered it had two full manuals, an acceptable range of voices, but no pedals! I muddled through, but only just! So you weren’t doing that on purpose? Some of us rather liked it. It certainly added informality to the Service, I thought. Definitely not intended, though – not on that occasion!